GF Piping Systems, a division of GF specializes in developing and manufacturing plastics and metal piping systems, has installed the largest injection molding machine in Switzerland in terms of clamping force and show weight. 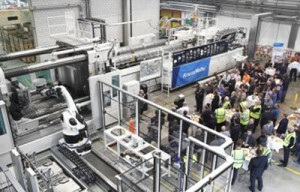 The MXH 3200 – 101.000/101.000 injection machine supplied by KraussMaffei, has begun production in late 2014, manufacturing large-volume pipe fittings with a diameter of up to 500mm that are used as connecting pieces for the public water supply. The machine has a clamping force of 32,000kN, a maximum shot weight of 120kg and a screw diameter of 2x265mm. It is equipped with an IR KR500 L340 industrial robot for handling of the pipe fittings. 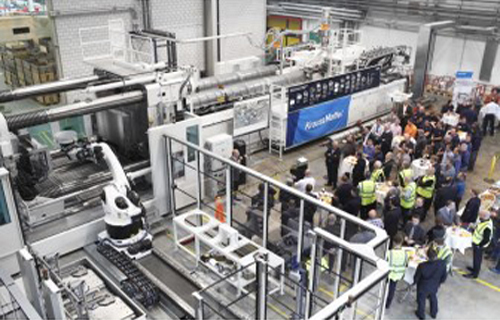 With a maximum payload of up to 340kg, this is said to be the largest industrial robot that has ever been installed on an injection molding machine. “The investment and implementation of a new injection molding system on this order of magnitude was certainly a special challenge for us. In addition to the technical parameters such as a high shot weight and high quality at every point, the system had to meet other criteria with regard to the flexibility in selecting materials and geometry,” said Claude A. Fischer, Head of Business Unit Utility at GF Piping Systems. One special challenge was the high viscosity polyethylene (PE) 100 material to be processed on the large machine. The solution involves optimized screw geometries and drives for the plasticizing unit which are specially designed for processing demanding material. “The controlled melt temperature during plasticizing prevents the melt from overheating during the plasticizing, preventing thermal decomposition of the material as a result. At the same time, a high plasticizing output with outstanding melt qualities is possible,” explained Bruno Schleiss, Managing Director of KraussMaffei Schweiz AG. GF Piping Systems is also looking for flexibility with regard to material, size and geometry when producing the pipe fittings. For this reason, the new injection machine is equipped with two injection units that can operate independently or interconnected as needed. The adapter modules of the plasticizing unit provide additional flexibility in the production of pipe fittings. For example, GF Piping Systems can install a smaller SP 33000 injection unit, making it possible to quickly change to production with other materials. The IR KR500 L340 industrial robot used has an additional axis for linear motion (7th axis), provides additional freedom of movement when handling heavy components. Its multi-functional gripper is designed for the various nominal diameters of the fittings. A special padding on the jaws protects the fittings from getting damaged. Large machines of the MX series feature a high melt quality and shot weight consistency, thereby ensuring continuously high product quality, KraussMaffei stated. Its BluePower Servo Drive Technology uses the high dynamics of servomotors to adapt the rotational speed of the hydraulic system pump to constantly adapt to the actual requirements. The same dynamics are used to reduce idling losses to almost zero by reducing the speed, such as during cooling times and during demolding, thereby reducing energy consumption significantly.